Guests of the Hotel Gaj Zagreb can enjoy Zagreb accommodation nearby to many of the area’s attractions, including restaurants, entertainment venues, and shops. The hotel is about five minutes from Lake Jarun, and it is ten minutes from the Zagreb Fair and other cultural activities. 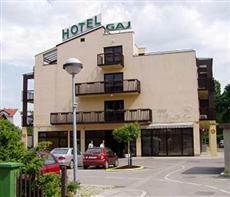 The Hotel Gaj Zagreb is easily accessible by car, and guests can walk to many of the area’s attractions, as well. The rooms of the Hotel Gaj Zagreb are comfortable and modern. All of the rooms in this hotel feature balconies overlooking the surrounding city, and all of the rooms have free wireless Internet access for the convenience of guests. The Hotel Gaj Zagreb is a modern facility that features an on-site restaurant serving both international and traditional Croatian cuisine choices. The hotel also has a pub where guests can enjoy drinks throughout the evening as well as other services, including a free Internet corner that guests can use to stay on top of their work or to communicate with people back home, car rental services, and free parking that is guarded overnight.